Out east on Long Island you can find what is arguably the most productive inlet in coastal New York in terms of birding. * The jetty-lined Shinnecock Inlet seems to be a magnet for marvelous birds which makes it, of course, a magnet for birders as well. When a Black Guillemot was reported there on Friday while I was home watching Desi, who was sick with bronchitis, I was really hoping it would stick around until Saturday morning. I had never seen one in New York State and it is the last alcid likely to show up in the state that I have not yet seen. With a winter storm fast approaching I had to get out to Shinnecock, which is just shy of an hour-and-a-half from my house, early. I set my alarm for 5:20 AM and was outside starting my car by 5:45. I should say trying to start my car because the battery had died overnight and it would not start. Eventually, I tracked down a neighbor who was up early, got a jump-start, and headed east, only an hour later than planned. 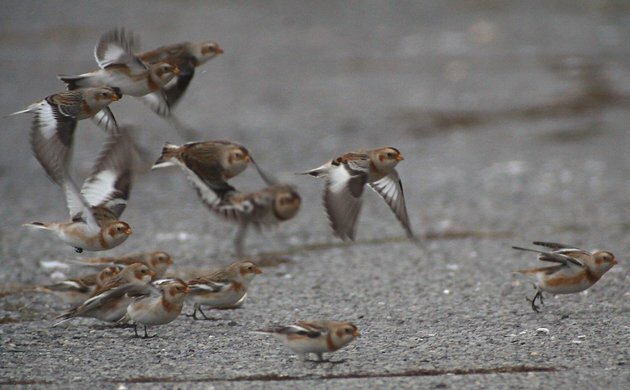 Before I even got to the inlet I saw a flock of Snow Buntings at the Tiana Beach parking lot and I felt compelled to give them the once over to make sure nothing else was lurking within the flock. 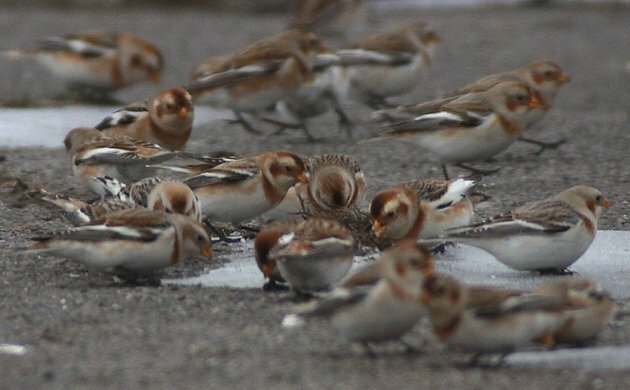 It was all Snow Buntings but I still appreciated the chance to digiscope them, though the low light from the oppressive cloud cover made the results less than I would have liked. By the time I was done with the Snow Buntings the snow had started so I hustled over to Shinnecock, which is only a few minutes from Tiana Beach, and headed out on the jetty. Holy cow was it cold! The wind whipped my back and left side as it blew blasts of cold air, snow, and salt spray from the northeast. 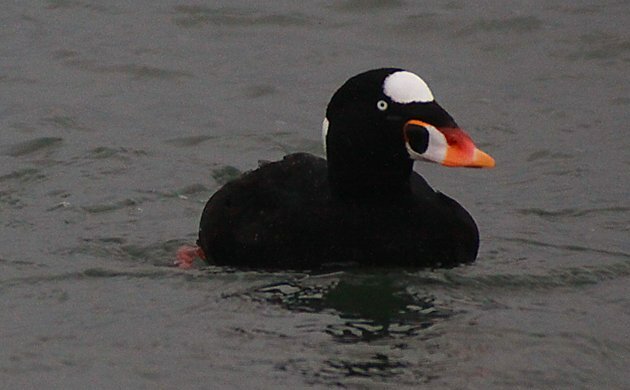 There was one other birder out there, scoping for the Montauk Quogue-Watermill Christmas Bird Count, and he let me know that the guillemot had not been seen though he had spotted a Glaucous Gull and a Harlequin Duck. Neither was evident as I scoped the inlet and the ocean, though Northern Gannets just off the end of the jetty, a host of sea ducks, four species of gull, and a constant flow of Long-tailed Ducks flying in and out of the inlet kept me busy. 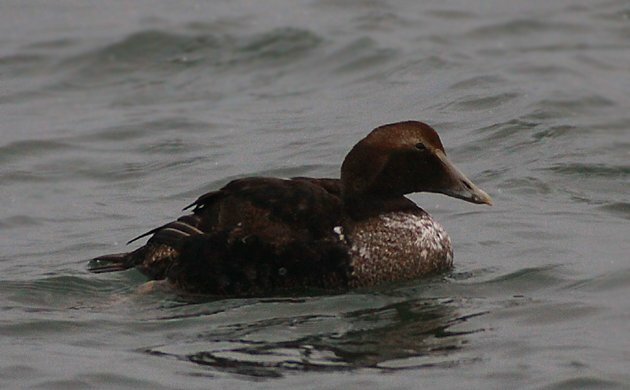 I really enjoyed watching the mixed flock of Surf Scoters, Black Scoters, and Common Eiders. They spent lots of time just off the end of the jetty and it was nice to have these ducks close enough to get a really good look at their field marks. 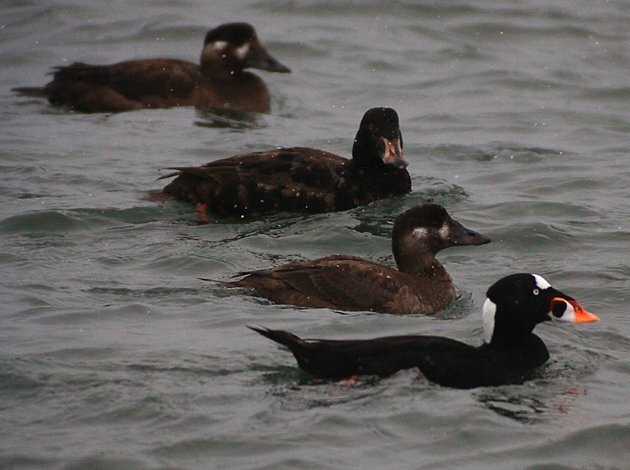 My careful search for the missing Harlequin Duck and Black Guillemot was rewarded when I found a single White-winged Scoter in the flock. Eventually, the cold got to be too much for me and I went back to my car to warm up. I then walked back out onto the jetty for one more go at the missing birds and managed to see the Glaucous Gull fly past and got distant looks at the Harlequin Duck on the western jetty. 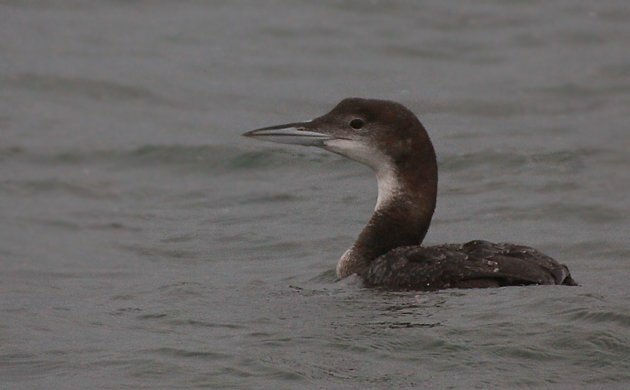 The guillemot never showed. It was nice to see two “Ipswich” Savannah Sparrows on the walk back to my car though. Shinnecock Inlet is good in any season but it is best in winter. Bundle up and enjoy it if you can get there! *Jones Inlet between Jones Beach and Point Lookout is the only real contender. Nice report on one of the most beautiful places on Long Island! 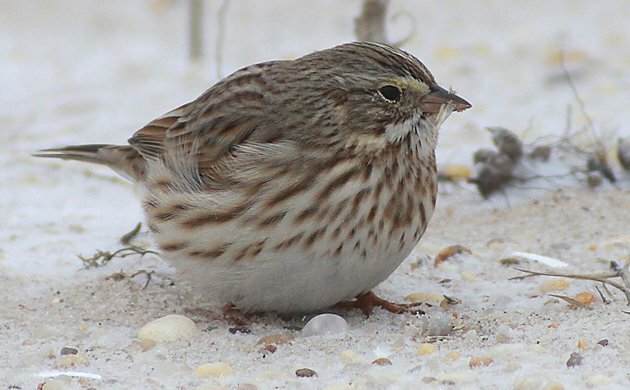 One minor correction – the birder you met at the Inlet, was participating in the Quogue-Watermill Christmas Bird Count. And we’re always looking for willing participants to stand out on that jetty in the cold wind! Thanks, Eileen, for both your complement and correction. I’m not sure how I could have thought the Montauk count would extend that far west!